At the entrance of the Tauferer Ahrntal, at 870 meter above sea level, is located the new golden landmark of the municipality of Sand in Taufers. The main characteristic of this building is his unique and straight functionality, which is reflected in a clear and simple shape. Short ways have received the highest due to their crucial influence during the efficient procedures of an operation. Further the compact and functional building, there's also a valuable appearance, where redundant ornaments were deliberately omitted. 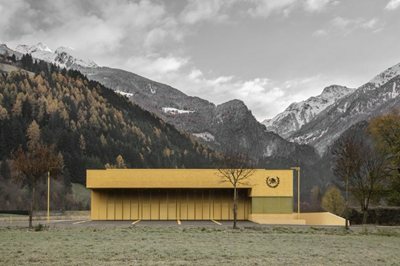 Therefore it was possible to advanced more proposals about shape, materials and colors: above all, the evident golden yellow plaster, rough-squirted on the facade, a playful and surprising attribute, which makes up the appeal of the new fire station. The building position in the site fulfills all the needs which a fire station should have: a big training space in front of the hall, enough parking and the possibility of an future extension of the building. The compact design is related in size and proportion to the small and fractional residential area in the north and to the large halls of the southern industrial area. Through cuts in the volume of the building, are defined protected areas, separated from the vehicle entrance area. The aspect is uniform and compact. The bearing structure is made of reinforced concrete and the interior finishes are made of drywall installation, so the building is very flexible for different uses. Sand in Taufers is known as an energy saving municipality and for this reason spends a lot on sustainable politics for environment and climate. Therefore also the fire station has to be an high level energy building; that's why the facades are isolated before being covered with a gritty plaster. The entrance gates, the doors and windows are disguised with colored sheet metal. The floors of the operating area are grippy, impact-proof and washable, while the floors of the lounge area in the second floor are wooden. The central room on the ground floor is the hall for the rescue vehicles and for this reason is directly connect to the street. The hall is set for vehicle care as well as for tube washing; is included also an area for boot washing. Newsroom and Control room form an operating-unit and are located directly behind the vehicle hall. Therefore you have a straight sight into the hall and on the courtyard, so that is easy to control all the operations. This two rooms for storing and maintenance of special equipment are prepared for their special using and also located directly beneath the vehicle hall and the changing room in order to have a fast access in case of operation. To guarantee a short distance in case of operation the clothing room is placed on the way from the entry to the vehicle hall. It’s size is adjusted to the local requirement and is divided in three areas: man, women and water rescue. Sanitary facilities are also included and divided between men and women, with toilets, washbasins and showers. The tube storage is located directly behind the tube washing area, on the back of the building in order to have a fast access in case of operation. In the laboratory room technical equipment can be maintained and cared and can be also done little repairing. In the equipment room can be stored equipment material as well as reserve team kits which are not frequently used. These rooms can reachable directly from the vehicle hall. Fuel storage and binder material storage are separate rooms and have external accesses. At first floor there is a training room for theoretical education of the team. The size is set on the local fire brigade size. The room is lighted by large windows and has an access to the roof top terrace, which can be used as a relaxing area. The tea kitchen is used to supply the team during the attendance and the operation. It is placed right next to the training room. There is one office for the commander or the administration chief, which is furnished with two tables and cabinets. The archive can be seen as an extension of the office, where more cabinets are provided. This room is divided in two areas: in front there is space for a small office and in back there is a changing room. The sleeping room provides an appropriate resting space for people who are on stand-by or in night duty. There are up to 3 beds. The cleaning room is for storing the cleanings and the tools. There is a sink as well as a changing room for the cleaning stuff. The provided toilets are separated between ladies and gentleman. The exhibition room is for the storage of historical equipments and there should come a small museum. In the clothes storage can be stored the necessary reserves for the fire brigade. The required technical room for the heating and ventilation system is located right under the installation pipeline. A separate room in the basement is built for the emergency power unit. The ventilation comes directly from the outside. These two areas provide additional storage for equipments which are not frequently used. In front of the hall there is a vaste front yard, which can be used as a training area. For this reason, it's equipped with a hydrant. There are enough parking in the north and in the east side of the site, obviously taking care about not crossing the emergency exit.